This page is for Easter eggs only. Easter eggs include inside jokes, pop culture references, and any similar reference to something outside the Elder Scrolls games. For other points of interest, like unfinished quests, please see the appropriate pages. Easter eggs are secrets that the developers put in games to give people a laugh when they find them (provided that they understand the joke or reference). Morrowind has a large number of such jokes. Easter eggs differ from in-game references in that they have been clearly hidden from the player and are unusual with regards to their surroundings; references are often integrated into the rest of game and no attempt is made to keep them secret. The book 1984, by George Orwell, is referenced several times throughout Morrowind. The Ministry of Truth—the moon floating above Vivec—is named after the government building in the book. In Azura's Coast (13, 5), you can find the corpse of an NPC named Arlowe. On the corpse is the BanHammer. This is a reference to the Something Awful Forums, where the site's creator, Richard "Lowtax" Kyanka, uses the Banhammer to ban trolls. On the forums, Kyanka is sometimes referred to as R-Lo, which is a homonym of Arlowe. The book The Art of War Magic has a similar name to and is written in the same style as Sun Tzu's The Art of War, the earliest surviving treatise on warfare. Compare "Victory in battle is only the least kind of victory. Victory without battle is the acme of skill." from the former book with "Hence to fight and conquer in all your battles is not supreme excellence; supreme excellence consists in breaking the enemy's resistance without fighting." from the latter. Also "The skillful battlemage ensures that the enemy is already defeated before the battle begins" vs "Hence the skillful fighter puts himself into a position which makes defeat impossible, and does not miss the moment for defeating the enemy", "The moment to prepare your offense is the moment the enemy becomes vulnerable to attack." vs. "To secure ourselves against defeat lies in our own hands, but the opportunity of defeating the enemy is provided by the enemy himself" and other similarities. Ashes of G. Lyngas, located in Ravel Ancestral Tomb. There are also four Glass Throwing Stars in this urn. Ashes of Lord Brinne, located in Samarys Ancestral Tomb. There is also the Mentor's Ring in this urn. Lord Brinne was the online name of Bill Iburg, an Elder Scrolls fan who died unexpectedly during the development of Morrowind. The urn, and his ashes, were placed in the game as a tribute. Lord Brinne also received similar tributes in other games that were in development at the time: Might and Magic VIII, Deus Ex and Ultima IX: Ascension. Ashes of D. Bryant, located in Falas Ancestral Tomb. There is also the Denstagmer's Ring in this urn. These three are all dedicated to former regulars at The Elder Scrolls Forums, all of whom passed away during production. A large proportion of names of Ashlanders, Egg Mines, and Daedric shrines are modeled on ancient Assyrian and Babylonian names from around the second millennium BCE. This is a very quiet joke on the resemblance between Ashlander and Ashur, the Akkadian name for ancient Assyria. Sargon cave—named after the founder of the first Assyrian Empire, Sharru-kin, a.k.a. "Sargon of Akkad"
Of course a few Daedric shrines, such as Ald Daedroth, are named purely in the fictional Dunmer language. A number of Ashlander names seem to be inspired from other sources, not all easily traceable; for example, the Foyada Mamaea, the Urshilaku Wise Woman Nibani Maesa, and some related names (Maesa-Shammus Egg Mine, Mamaea cave) are named after women in the royal family of the third century CE Roman emperor Elagabalus, namely Julia Mamaea and her daughter Julia Avita Maesa. In No-h's Picture Book of Wood, it states that "Boat Ack" was scrawled in a vandalistic manner all over the page. In his teen years Kurt Cobain enraged a neighbor by vandalizing a boat with these same words (as alleged by C. R. Cross in his book Heavier than Heaven). The Book of Dawn and Dusk is a collection of proverbial sayings found throughout Morrowind. However, the last two of these sayings seem to be English translations from two songs, in Latin, found in Carl Orff's Carmina Burana. The first, "Fate, monstrous and empty, the whirling wheel of evil", is from the popular "O Fortuna": "Sors immanis / et inanis / rota tu volubilis / status malus." The second, "How black my heart, roasting fiercely? ", is taken, loosely, from "Olim lacus colueram", in which a swan sings about being cooked and eaten: "Miser, miser / modo niger / et ustus fortiter!" In the Sea of Ghosts (9, 23), northeast of Dagon Fel, there's a strange bottle which contains a worn and weathered note. The text is poetic and mysterious; it probably refers to Edgar Allan Poe's story "MS. Found in a Bottle". 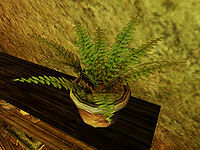 In Jobasha's Rare Books (located in Vivec's Foreign Quarter), atop a bookshelf in a corner at the bottom of the stairs, there is a potted plant. If you look very closely at the plant, you'll see that it has been bestowed with the name "Charles the Plant". But that's not all! Charles also has Meteor Slime, an Alchemy ingredient used to make potions. This is a reference to the Maniac Mansion and Day of the Tentacle games by LucasArts which included a plant named "Chuck the Plant". Just make sure no one sees you take it! Creeper is simply a Scamp in the Ghorak Manor in Caldera. Well, simply a non-aggressive scamp that also happens to be a merchant with 5,000 gold and is one of only two merchants who pays the full price for items (the other being the Mudcrab merchant). As interesting as you'd think a lesser Daedra living in a house full of Orcs would be, Creeper is surprisingly down to earth, wanting nothing more than to "bang on my drum", in his own words. It is important to note that he's not above attempting to supply the player character with things such as alcohol in an effort to secure business. Creeper is actually based on a friend of Mark Nelson (BlueDev) who was an unemployed drummer during some part of Morrowind's development. Creeper's words "Don't want to work. Just want to bang on my drum." are a reference to the song "Bang the Drum All Day" by Todd Rundgren. Talking to Ash Slaves (by remaining undetected before speaking to them) yields some interesting results: they seem to think the furniture is speaking to them. This explains some of the odd arrangements in Sixth House bases. After obtaining Goldbrand and undergoing a few steps, you can change it to Eltonbrand, the name of which is a reference to an American basketball player named Elton Brand who played with the Duke University Blue Devils in college. This easter egg was built in by Duke alumnus Mark Nelson (a.k.a. BlueDev, a nickname which also appears in the object ID of the sword). The phrase "Go to Hell, Carolina!" when you obtain Eltonbrand is a reference to the Blue Devils' arch-rival, the University of North Carolina at Chapel Hill's Tarheels, who are also referenced elsewhere in the game (see the entry for Tarhiel in this page). The amount of gold required (11,171) is variously thought to be a reference to Nelson's birthday, 11/1/1971, or to a 111–71 Duke victory over the Tarheels. The name of the quest that makes Eltonbrand obtainable, "Shashev's Key", is also a reference to a long-time coach of the Blue Devils, Mike Krzyzewski, whose last name is pronounced "shə-SHEF-ski". It is usually regarded as a reference to "phat lewt" or "fat loot", a term used in MMORPGs to describe good loot/drops. A "Fat Lute" can be found in Hassour, a sixth house base south of Balmora. Another can be found carried by a bandit in Adanumuran. In Bloodmoon, another is carried by the Nord bard Bathmar Bold-Lute, who appears in Thirsk after a series of quests. In the Urshilaku Burial Caverns, there is a room called Kefka Burial, which is a reference to Kefka, the antagonist in Final Fantasy VI. The popular fishy stick image. The Capn's Guide to the Fishy Stick is an in-game book that is unreadable due to being "smeared with fishy stick sauce". The Fishy Stick is a reference to an interesting tradition of the Bethesda official forums, giving fishy sticks to new members, which was started by Captain Eldrad, this tradition has been continued on the Nexus Forums, where a senior member bestows a Fishy Stick upon new members. There is also a more detailed article on the origin and history of the fishy stick. The Gambolpuddy is an enchanted glove that plays a central role in the quest Sheogorath of the House of Troubles. Its name may be a reference to Johann Gambolputty, a fictional composer with an excessively long full name who is featured in a Monty Python's Flying Circus sketch. Gentleman Jim Stacey, leader of the Thieves Guild in Morrowind, may be a reference to children's author Raymond Briggs' comic "Gentleman Jim", in which the main character, Jim, becomes a highwayman to steal from the rich and give to the poor. This is backed up by the fact that Gentleman Jim Stacey attempts to create a new group of Bal Molagmer, who stole from the unjust and gave to those in need. In the Grazelands region, there is a spawn point that spawns creatures double the size that they are normally. The specific spawn point is west of the Nerano Ancestral Tomb, which is west of Vos. The Scrolls of Icarian Flight that may be obtained from Tarhiel are named after Icarus, a character in Greek mythology who attempted to escape from Crete using wings created by his father by attaching feathers together using wax. Icarus flew too close to the sun, which melted the wax causing him to plunge to his death. Tarhiel could not have chosen a much more appropriate name for his new scrolls. The in-universe explanation of the name is seen in ESO, which features a character named Icarian, who researched similar spells with the same tragic result hundreds of years before Tarhiel. The body of Indiana Jones can be found in the Omalen Ancestral Tomb. Apparently a rock fell on his leg, dooming him to a slow death. There's a scroll that records his last thoughts, signed "Indie". It also mentions that his father made jokes about his childhood pet. In the movie The Last Crusade, Indiana's father exclaims at the mention of Indiana's name: "We named the dog Indiana!" This would be the childhood pet the scroll mentions. In the game you hear about a great warrior named Miles Gloriosus. He can be found in Maar Gan at the Andus Tradehouse downstairs in his own room. For the Thieves Guild in Ald'ruhn, you have to steal a book from him. This character's name is borrowed from a play of the same name by the Roman comic writer Plautus, where the character Pyrgopolynices (which can be loosely translated as "Boasts about many victories") is the miles gloriosus (boastful soldier) of the title. This name has been used in many Roman comedies ever since, as well as the more recent play and film "A Funny Thing Happened on the Way to the Forum".
" Kva! Kvak! is the newsletter of the La Ranetoj. It is sent to paying members and other individuals who, in some way, are involved in la Ranetoj's activities. In it there firstly is information about the locations of the monthly meetings, but of course also concerning the latest activities of the club. Sometimes it also includes other educating or entertaining material. The Internet-based Kvako are on the one hand another distribution channel for the contents of the paper version. But on the other hand, not surprisingly, the contents of the different versions cannot, and even must not, always be 100 percent the same. For instance, in little circulating paper versions you can publish illustrations that, for copyright reasons, cannot be used on the Internet. Yet, on the other hand, the low costs of the Internet version lift the space limits and allow more content, not to mention being always up to date. These circumstances influence the web-based Kvako, which will also serve as the general homepage of the 'La Ranetoj'." More about the translation of N'Gasta! Kvata! Kvakis! can be found at The Imperial Library article. In Mudan Grotto there's a skeleton called "Peke Utchoo", which sounds quite similar to the Pokémon Pikachu. Whoever put the skeleton in also included a note that reads, "If anyone shall ever find me, I hope I am able to bring them to laughter." The note was probably put in to make sure that the player realizes that the skeleton is meant to be a joke. Encountered during the Main Quest, there are a few locations which reference Pokémon in their names. In Ilunibi, there's a section called Marowak's Spine. In Arkngthand, there's a Weepingbell Hall. In the Urshilaku Burial Caverns, there is a section called Kakuna Burial. In Kogoruhn, there is a section named Charma's Breath. During Morrowind's development one of the programmers, Steve Meister (formerly known as MrSmileyFaceDude, but currently known as SteveMeister), had an Argonian character named Scourge. During the course of Scourge's career as a test character, he got into some trouble with the law and was eventually killed. After seeing the "Lizard's Head" bar in Vivec (and an Argonian head mounted on a plaque within the bar), Mr. Meister decided that Scourge needed to be enshrined there. The Head Of Scourge can be found in the back room of the previously-mentioned bar. Somewhat similar to Creeper, the Talking Mudcrab Merchant is a thirsty Mudcrab-turned-merchant. However, the Mudcrab merchant is also quite difficult to find since it doesn't live anywhere near civilization, and it is labeled like a regular Mudcrab, but it does have a healthy supply of gold (10,000). See the online map (map). He is also one of the only merchants in the game who buys items at full price, but he only buys weapons, armor, and potions. On the road north of Seyda Neen, it will begin to rain Bosmer. Yes, quite literally, a Bosmer male named Tarhiel will fall from the sky. Generally, he will land on the ground with a thump and promptly die, but you can save him by saving and then loading the game before he hits the ground, casting a spell of slow fall or levitation on him. The reason this is an easter egg is Tarhiel's name is actually a reference to the University of North Carolina Tar Heels, and his game id agronian guy is a reference to North Carolina's top Agronomy program. Duke, one of North Carolina's main rivals, is also referenced in the game (see Eltonbrand). This Easter Egg was probably added by Mark Nelson. Gary Noonan (formerly known as WormGod, but currently known as VXSS), one of Morrowind's developers, added a trio of characters to represent himself, his girlfriend (at the time), and his father (who died during development). Noonan himself and his girlfriend can be found in Ald Daedroth under the names Je Tee and Kar Alber (the first being Noonan and the second his girlfriend). Noonan's father is a skeleton in Senim Ancestral Tomb named Pop Je. There was a rumor that Pop Je was an active member of the Elderscrolls community who died during Morrowind's development, but Gary Noonan put those rumors to rest. Another Easter Egg attributed to Gary Noonan (VXSS) is the writing on the Dwemer pipes. During Morrowind's development, Noonan went by the name of WormGod in the Elderscrolls community (and even now it isn't uncommon for older members of the community to call him Wormy). The strange writing on the Dwemer pipes in their ruins is actually just 'Wormgod' written over and over again in a form of Dwemer script known as Wormgod script. For more on what this script is and what it looks like see the Dwemer Alphabet article. A highlighted page from The Egg of Time. 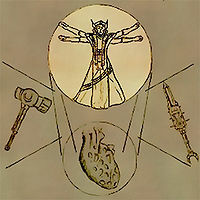 The in-game book The Egg of Time depicts a Dwarven figure in an image inspired by Leonardo Da Vinci's Vitruvian Man. Within the Construction Set, there are two additional recordings of the game intro done in voices other than Azura's. Of course, after listening to the recordings, it is clear that they are actually just the voices for the male Wood Elf and male Argonian. Perhaps they were just auditions, but for some reason they still exist in the game. Within the Morrowind\Data Files\Sound\Fx directory, there is an audio file named "funny.wav" which does not appear in the game. This file is of a synthesized voice saying "Critical Damage" in a rising pitch. In the Morrowind\Data Files\Sound\Cr\kgout directory, there are a few extra sounds for the Kagouti. Apparently, before the final Kagouti sound was chosen, the developers decided to use a few place holders. These are all the sound files suffixed by '2' (e.g. moan2). These sounds sound kitten or catlike, featuring short but ridiculously silly Meows and Growls. The Kagouti sounds were probably pitchshifted down from these sounds. M'Aiq the Liar, a character whose comments are references to events and features of the game (both new and removed), jokes, and Easter Eggs. This page was last modified on 25 December 2018, at 16:19.